Parents and Caregivers are encouraged to help at Our Lady of the Cape. It is best to talk to your teacher directly to discuss the best times for classroom help. Please read the newsletter carefully as we often call for the assistance of parents at special events for our school. 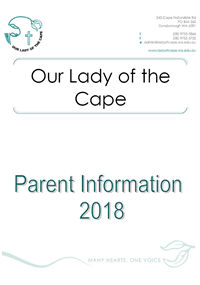 Also, if you feel you have special skills and/or resources to offer Our Lady of the Cape please let it be known to the principal. Parents are notified, in writing, regarding each excursion and written permission to participate is requested. Excursions and incursions are aimed at enriching the work in the classroom, increasing general knowledge, developing an appreciation of our country, socially enjoying each other’s company and encouraging class spirit. Parents will generally pay for Incursions/Excursions throughout the year. The children will have an opportunity to participate in a school camp in Year 5 and in Year 6. The needs of the class and experience of the teacher will be taken into consideration when plans are formulated. Each camp will provide its own distinct ethos, thereby ensuring variety and a broad range of experiences. Children will be supervised at all times. The ratio of teachers to children will be determined by the type of activities being conducted on camp and are subject to the school Camps and Excursions Policy. All parents are required to complete the necessary excursion/camp forms before their child is permitted to participate. Parents will be notified, either by letter or meeting, as to camp plans and procedures, and are encouraged to contact the Year 5 or Year 6 teacher’s concerning any problems. Parental involvement on excursions will be welcomed when required. Parents accompanying student’s away on overnight camps must by law obtain a Working With Children clearance check. For further information, please contact the school office.